This is the type of music, “funeral doom”, that can be difficult to judge thoroughly. Is it funereal? “Check”. Funereal in what way? “Well, it’s very, very slow and miserable. This isn’t the funeral of someone you never really liked anyway. It’s the funeral of everyone and everything you ever loved, sort of”. Then, congratulations, you have created some passable funeral doom metal. Does it really bear that much more in-depth analysis? It seems to me that in order to mean something, this genre needs epic imagery; something conceptual to anchor it in our imagination. 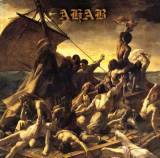 As you may guess from the band name, and the cover artwork, and have rammed home by the album title, Ahab’s The Divinity of Oceans concerns itself entirely with the sea. That’s probably a good idea: what is possibly more epic than that? They even refer to themselves as “Funeral Nautic Doom Metal”. Aside from the lyrics, though, you may not pick up this concept from the music alone. It’s not like other notable water-themed metal works of recent times: Giant Squid’s The Ichthyologist, or Mastodon’s Leviathan, in which the scent of sea air wafts from every riff. Styllistically, it’s fairly straightforward by the standards of this type of thing; comparable to Shape of Despair, with less synthed strings and more dynamic variation. In a way, it’s simply too slow, and at times even peaceful, to musically represent the raging ocean. Well, perhaps. The sea has many moods, and so does this, in a way. What lifts it, for me, is the gently proggy, slightly faded out, lead guitar lines that infest the album. They float gracefully across the slowly heaving sound, giving lengthy passages of crawling riffs a melodic focus they’d totally lack otherwise. The frequently-used clean vocals have the same sort of effect, with a mournful, slightly malnourished delivery. It gives me the impression of starving on a raft in the middle of a currentless ocean in the blazing heat, so perhaps there’s the connection. It is the forlorn aftermath of Gericault’s cover painting, rather than a description of the moment itself. It’s the kind of music to listen to whilst deciding which of your best friends to eat first. These dolorous melodic passages generally produce more interesting music than more standard chugging. So, this succeeds in being atmospheric, evocative, and generally unhappy. It’s distinctive, with a surprisingly deft touch when it comes to thoughtful dynamics. Recommended for those into this type of thing, few though they are.